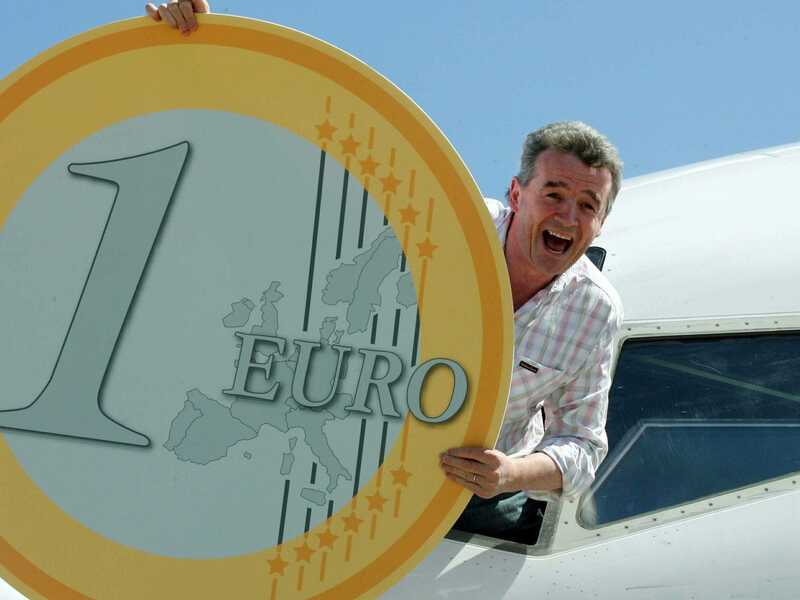 REUTERS/STR NewRyanair’s CEO, Michael O’Leary, during one of the company’s regular publicity events. Ryanair hiked its profit forecast by 18 per cent on Monday on better-than-expected winter bookings and said it would cut fares by up to 10 per cent in the spring to boost its share of the European short-haul market. The Irish airline said it would carry 2.2 million passengers more than previously forecast in the six months to March. According to Bloomberg, on a results call, Ryanair’s outspoken CEO Michael O’Leary explained why a slowing European economy would be good news for the budget airline: “I always have concerns about the European economy, but customers are getting more and more price sensitive and are switching to Ryanair even more,” he said. That should allow it to boost its profit after tax for the 12 months to March to between 750 and 770 million euros, up from to a previous forecast of 620 to 650 million euros, it said in a statement. It expects to fly 89 million passengers in the year to March compared to 82 million in the same period last year. The hike comes after the airline announced a series of improvements to its customer service and a new business product that allows passengers to change their bookings for free. Higher-cost rivals Lufthansa and Air France have both lowered their profit forecasts in recent days on higher competition and the cost of industrial action.